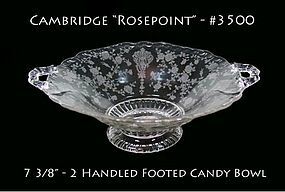 This Rosepoint #3500 footed candy was made by The Cambridge Glass Co. in the 1930's. It is 7 3/8" across and in excellent condition! 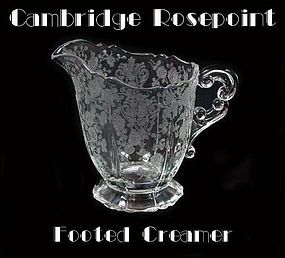 This Cambridge Rosepoint footed creamer is in excellent condition! 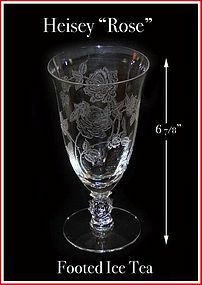 Heisey Rose 9 ounce Stemmed Water Goblet - Excellent! 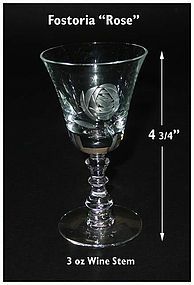 This Heisey 9oz stemmed water goblet was made in the 1950s and has the Rose etching on it. This is very high quality! 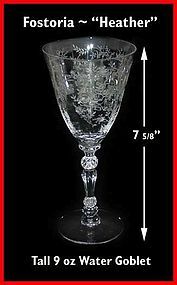 No damage or flaws of any kind, and there is no cloudiness to the glass. 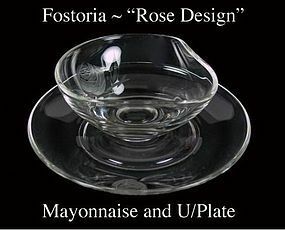 Estate fresh, and they don't appear to have been used at all. We will gladly combine shipping on multiple purchases. 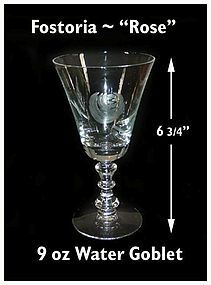 There are 8 goblets available @ $21.00 each. 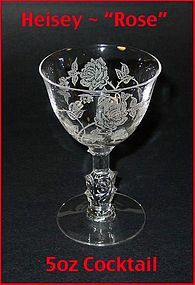 This Heisey 5oz stemmed cocktail goblet was made in the 1950s and has the Rose etching on it. This is very high quality! 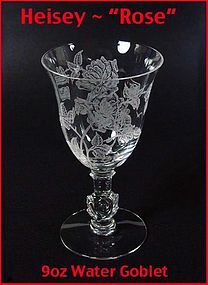 No damage or flaws of any kind, and there is no cloudiness to the glass. Estate fresh, and they don't appear to have been used at all. We will gladly combine shipping on multiple purchases. 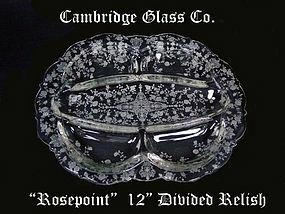 This 1930's Rosepoint 5 part divided relish was made by the Cambridge Glass Co. It is in excellent condition! This is the most desireable of all the different Cambridge Relish dishes. These tall footed 12 oz ice tea glasses are in excellent condition. 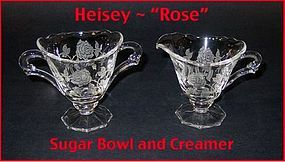 They were made by The Heisey Glass Co on the Waverly blank in the 1950's. 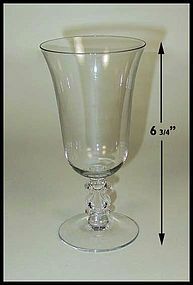 Cambridge Stradivari 6 3/4" tall, 3 3/8" wide 10 ounce water goblet. 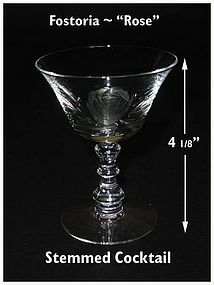 Made during the depression era by Cambridge Glass Co. Excellent condition! 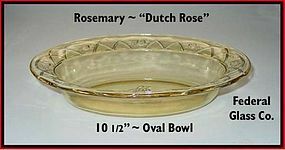 This Rosemary "Dutch Rose" 10" oval vegetable bowl was made by the Federal Glass Co. in the mid 1930's. Beautiful! 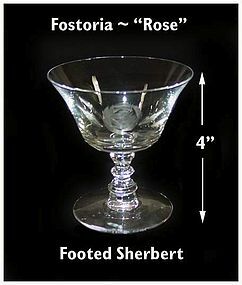 This tall Heather water goblet was made by Fostoria and is in mint condition! 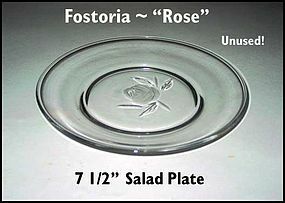 This pattern is called "Rose" and was made by Fostoria in the 1950's. 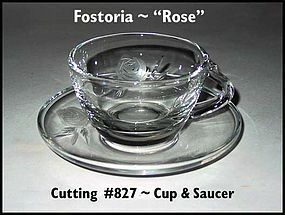 The cutting number is #827 and all of the pieces we have are in unused condition. Very high quality!